Background Although guidelines recommend secondary cardiovascular prevention irrespective of age, in older age the uptake of treatment is lower than in younger age groups. Aim To explore the dilemmas GPs in the Netherlands encounter when implementing guidelines for secondary cardiovascular prevention in older age. Design and setting Qualitative study in four focus groups consisting of GPs (n = 23, from the northern part of the province South Holland) and a fifth focus group consisting of GP trainees (n = 4, from the Leiden University Medical Center). Method Focus group discussions were organised to elicit perspectives on the implementation of secondary cardiovascular prevention for older people. The 14 theoretical domains of the refined Theoretical Domains Framework (TDF) were used for (deductive) coding of the focus group discussions. The coded texts were analysed, content was discussed, and barriers and facilitators were identified for each domain of the TDF. Results The main theme that emerged was ‘uncertainty’. Identified barriers were guideline-related, patient-related, and organisation-related. Identified facilitators were doctor-related, patient-related, and organisation-related. The main aim of secondary preventive treatment was improvement in quality of life. Conclusion GPs in the Netherlands are uncertain about many aspects of secondary cardiovascular prevention in older age; the guidelines themselves, their own role, patient factors, and the organisation of care. In view of this uncertainty, GPs consciously weigh all aspects of the situation in close dialogue with the individual patient, with the ultimate aim of improving quality of life. This highly-individualised care may largely explain the reduced prescription rates. Understanding these low prescription rates,4 requires insight into the ideas that healthcare professionals have regarding secondary cardiovascular prevention. Various doctor-related mechanisms may contribute to the observed undertreatment; for example, lack of knowledge10,11 or difficulties interpreting current guidelines,12 resistance to application of current guidelines in older age,13 lack of skills, lack of time,14 reduced sense of self-efficacy,15 uncertainty about their role,16 or lack of financial resources.11,17 Also, patient factors, such as vulnerability,18 the presence of comorbidities,19 drug interactions, and/or side-effects,20 may lead doctors to decide not to treat older patients. In addition, older patients themselves may fail to attend follow-up consultations, or stop taking medication because of illness perceptions21,22 or side-effects. Besides these individual factors, the organisation of health care also may influence treatment uptake. Therefore, this study explored the kinds of dilemmas encountered by GPs, and which barriers and facilitators they experience in daily practice, when implementing guidelines for secondary cardiovascular prevention in older age. In 2013, five focus group discussions were organised to elicit GPs’ and GP trainees’ perspectives on the implementation of secondary cardiovascular prevention for older people. This qualitative method was chosen as it allows participants to discuss their own perceptions, reasoning, and strategies with their colleagues and allows interaction between the participants. In the focus groups the GPs elaborated on the emerging barriers and facilitators and, thereafter, differences between them were discussed. Participants for the focus group discussions were invited via a general mailing list of GPs (located in the northern part of the province South Holland), resulting in 17 positive responses. To ensure inclusion of GPs with scientific and/or educational expertise, as well as younger GPs, GPs with additional expertise (GPs with special interest in geriatric care or organisation of care, research, or GP teachers of vocational training for general practice, n = 6) and GP trainees just before graduation (n = 4), were purposively sampled from the Department of Public Health and Primary Care, Leiden University Medical Center, the Netherlands. The first three focus group discussions were organised with GPs who responded to the mailing and the last two focus groups were the purposively sampled GPs and GP trainees. Each group contained four to eight GPs. Although secondary preventive medication remains effective in older age, prescription rates decline with age. This could be explained, to a large extent, by secondary cardiovascular preventive care in older age being highly individualised, with the ultimate aim of improving quality of life. Age-specific guidelines and structured annual follow-up may help improve implementation of guidelines for secondary cardiovascular prevention in older age. An interview guide was developed to explore GPs’ ideas about secondary prevention for older people (Appendix 1). First, the focus was on the dilemmas experienced in daily practice with regard to secondary prevention, and then investigations were made of the organisational aspects of secondary preventive care. The interview guide was piloted in the first discussion group. Because the guide yielded satisfying results, no adjustments were needed and the pilot group interview was included in the final analysis. Before the discussion, participants gave written consent and completed a brief questionnaire about their practice and experience; they were assured that all comments would remain confidential. Each focus group was led by the same researcher, who was experienced in moderating such groups and assisted by another researcher who made field notes. Each session lasted about 90 minutes (range 70–100 minutes) and the researchers debriefed after each session. Audiotapes were transcribed and promptly reviewed to clarify any unclear comments and/or to link each comment to the relevant participant. The 14 theoretical domains of the refined Theoretical Domains Framework (TDF)23,24 were used for (deductive) coding. This framework consists of 14 domains relevant for implementation of evidence-based practice, that is knowledge, skills, beliefs about capabilities, optimism, beliefs about consequences, reinforcement, intentions, goals, memory attention and decision processes, environmental context and resources, social influences, emotion, and behavioural regulation. Atlas ti.6 was used for the analysis. Two researchers independently coded the focus group discussions to increase reliability. After coding, the coded texts were analysed, content was discussed, and barriers and facilitators were identified for each domain of the TDF. In the fifth focus group session no new barriers and facilitators emerged, indicating that saturation had been reached. Reports on the barriers and facilitators for each domain were read and reread, to identify and synthesise the range and weight of the views of the participating GPs and GP trainees, to reveal emerging categories and themes. Table 1 presents the characteristics of the study group: 23 GPs and four GP trainees with a range of experience, additional skills, and practice characteristics, participated in the focus group discussions. During the focus group discussions an overall theme emerged: uncertainty. For example, GPs were uncertain about the guidelines, uncertain about the consequences of application of the guideline for the individual older patient, and uncertain as to whether they had properly identified all patients with a history of CVD. In view of this uncertainty, GPs weigh all aspects of secondary preventive care in a shared decision-making process with each individual patient. In all focus group discussions GPs stated that the ultimate aim of secondary cardiovascular prevention in older age was improvement of quality of life (Figure 1). A systematic way of organising cardiovascular risk management contributed to the confidence of the GPs. Process of implementing guidelines in secondary prevention in older age as mentioned by GPs. 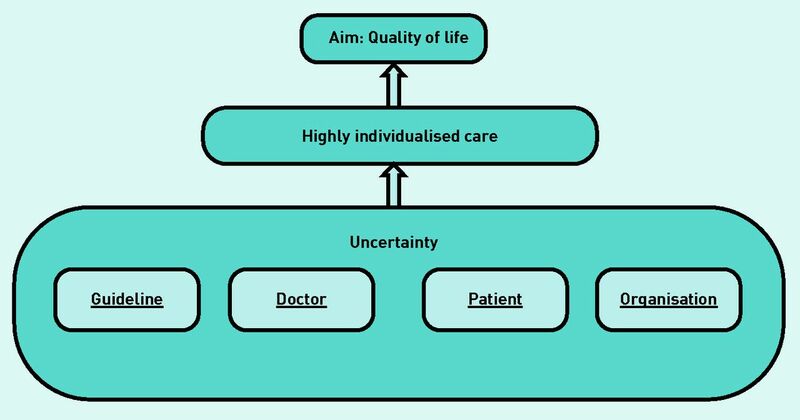 Uncertainty was related to four categories leading to highly-individualised care with the ultimate aim to improve quality of life. Based on these findings, the main experienced barriers and facilitators for implementation of guidelines for secondary prevention were grouped into four categories: guideline-related, doctor-related, patient-related, and organisation related (Box 1). These are described in detail below. ICPC = International Classification of Primary Care. Appendix 2 summarises all the reported barriers and (proposed) facilitators for implementation of the guidelines for secondary prevention of CVD in older age. Some GPs mentioned that simply explaining that there is a risk for recurrent CVD disease that can be reduced by medication was enough for them. In contrast, GP trainees did not mention either of these above items. In addition, GP trainees found it more difficult to advise cessation of medication that had been initiated by a specialist. Apart from these two findings, no other differences emerged between GPs and GP trainees. Patient characteristics and preferences were important. However, most GPs were uncertain whether lifestyle interventions and/or preventive medication would be justified in the older patient, as they were uncertain whether the patient would live long enough to benefit from such measures and medications. Also, if the cardiovascular event occurred a long time ago, some GPs were less motivated to start full preventive treatment. Comorbidity influenced treatment decisions as well: one GP mentioned that patients with dementia or terminal disease were excluded from her protocol for annual follow-up. Side-effects, especially from statins, were the most frequently mentioned reason to stop treatment. Also, orthostatic hypotension with a risk of falls, was a reason to reduce or stop treatment. Side-effects of antithrombotics were seldom mentioned. In all focus groups there was consensus that a system of structured annual follow-up organised by the practice nurse would be ideal. Most GPs would like to care for these older and mostly complex patients themselves, but often lacked the time; therefore, some already entrusted the care for these patients to their practice nurse. In general, GPs said that structured International Classification of Primary Care (ICPC) coding and a practice nurse were absolutely necessary for organising secondary cardiovascular preventive care in older age. Some GPs expressed uncertainty about financial support for the organisation of this care. Others felt pressurised by the insurance companies to achieve standard targets for blood pressure and cholesterol, but felt uncomfortable because they considered these targets inappropriate for their (very) old patients. Some GPs mentioned that they had negotiated with insurance companies and set specific targets for blood pressure and cholesterol for their (very) old patients. Within the entire spectrum of organisation of care for vulnerable patients, secondary cardiovascular prevention was losing relevance for some GPs, but had gained importance (prevention of further functional decline) for others. This focus group study explored GPs’ (and GP trainees’) perspectives on implementation of secondary cardiovascular preventive care in older age. The main emerging theme was ‘uncertainty’: GPs generally feel responsible for secondary prevention in older patients with CVD, but expressed uncertainty about the guidelines themselves, doctor-related and patient-related aspects, and aspects concerning the organisation of this care. With regard to the guidelines, GPs question the scientific background and are uncertain because they are not specific for older patients. Specified target values and exact figures of benefit and harm in older age, would facilitate GPs to implement guidelines in older age, because GPs want to explain all expected benefits and risks to their individual patients. An important doctor-related facilitator to reduce uncertainty mentioned by GPs, was shared decision making. Other facilitators were prevention and treatment of symptoms, and expected improvement in quality of life. An interesting finding was that anticipated regret (for example, fear for development of a stroke after a TIA) motivated many experienced GPs to optimise secondary preventive measures, whereas this was not mentioned by GP trainees. High absolute risk of recurrent cardiovascular events in older age may drive this phenomenon. Important patient-related barriers, according to the GPs, were development of side-effects, lag time to benefit, a cardiovascular event long ago, as well as vulnerability. Facilitators were vitality, prevention of symptoms, and (expected) improvement in quality of life. There was consensus that the final aim of secondary cardiovascular prevention in older age was not prolonging life, but improvement in quality of life. Concerning the organisation of care, GPs expressed uncertainties on whether they had identified all patients properly, because they feared, or had already experienced, that some patients were lost in the gap between primary and secondary care. Facilitators mentioned were ICPC coding of all patients with CVD, and yearly check-ups organised by a practice nurse. In conclusion, according to the focus group discussions, GPs in the Netherlands feel responsible for secondary cardiovascular prevention in older age, but are uncertain about many aspects of this care. GPs consciously weigh all aspects in close dialogue with the individual patient, with the ultimate aim of improving quality of life. For some patients this leads to vigorous interventions on lifestyle and medication, whereas in others it leads to refraining from further action and stopping medication. Low prescription rates in secondary cardiovascular prevention in older age may largely be explained by this highly individualised care with a shift in goals in older age, that is from prolonging life to improvement in quality of life. By organising focus groups including general GPs and purposefully-sampled GPs in the Netherlands, a spectrum of barriers and facilitators has been revealed with regard to implementation of secondary cardiovascular preventive guidelines in older age. Emerging themes were analysed in the focus group discussions leading to identification of the central theme of uncertainty. A possible limitation is that focus groups could yield more socially acceptable answers. Also, the participating GPs may have a special interest in this group and may have been more motivated to organise the care for these patients. Further quantitative research in a larger group of GPs, using a questionnaire based on the findings from the focus group discussions, would allow addition of new insights to the findings from the current study. With regard to uncertainty, Fried et al also observed that practising clinicians struggled with the uncertainties of applying disease-specific guidelines to their older patients with multiple conditions, and that they needed more data and alternative guidelines.19 Heath recently noted that uncertainty exists in the gap between the territory of human suffering and the map of biomedical science and that doctors need not be afraid of it and to always consider the concrete but, if necessary, have the courage to disregard the rules.25 The present study shows that, in the presence of uncertainty in secondary cardiovascular prevention in older age, GPs had the courage to ‘bend’ the rules. In line with the barriers and facilitators mentioned by the GPs, Swedish GPs reported that communicating elevated cardiovascular risks to patients with diabetes was difficult and that treating symptoms was easier.16 Bally et al observed that two-thirds of the discontinuations of pharmacotherapy after myocardial infarction was indeed initiated by GPs, because of the presence of side-effects.20 In contrast with the present findings, in a survey among European GPs on primary prevention of coronary heart disease, prescription costs, as well as patient compliance and adherence, were important aspects.12,14 These latter studies also recommended simplifying guidelines for primary prevention, whereas in the present focus groups on secondary prevention, more detailed specification of the guidelines was recommended. To facilitate implementation, the present authors recommend development of specific (attenuated) targets and specific charts showing benefits and risks for older people, and to incorporate these into current guidelines for secondary cardiovascular prevention. GPs can then use these in shared decision making with their individual older patients with a history of CVD. To improve active follow-up of patients that need secondary preventive care in older age, ICPC coding of all CVDs is necessary and practice nurses should be instructed to organise structured care with annual follow-up. Future dedicated research that accounts for the heterogeneity of older patients with a history of CVD is necessary to gather evidence for the development of tailored guidelines for secondary cardiovascular prevention in older age. Research on patient perspectives on secondary cardiovascular prevention may help further unravel the underlying reasons for low treatment uptake in older age. After development of age-specific guidelines for secondary cardiovascular prevention in older age, it is recommended that further implementation studies are done to examine whether these guidelines will indeed change practice. The authors thank all GPs and GP trainees that participated in the focus group discussions. When you think of older patients in your practice with a history of cardiovascular disease, which dilemmas play a role in the treatment of these patients? When did you doubt whether or not to start? Did vulnerability play a role? How important is secondary cardiovascular prevention in older persons? Who is responsible for secondary cardiovascular preventive treatment for this age group? Ideally, how would the care for these patients be organised? As a GP, what is your role in the organisation of care for these patients and what hindering or facilitating factors do you experience? Petra G van Peet received a grant from the SBOH (employer of general practitioner trainees), a foundation funded by the Dutch Ministry of Health, Welfare and Sports. Revision requested March 9, 2015. (2014) The ACC/AHA 2013 guideline on the treatment of blood cholesterol to reduce atherosclerotic cardiovascular disease risk in adults: the good the bad and the uncertain: a comparison with ESC/EAS guidelines for the management of dyslipidaemias 2011. Eur Heart J 35(15):960–968. (2013) 2012 update of the Canadian Cardiovascular Society guidelines for the diagnosis and treatment of dyslipidemia for the prevention of cardiovascular disease in the adult. Can J Cardiol 29(2):151–167. (2010) Time trends in preventive drug treatment after myocardial infarction in older patients. Br J Gen Pract doi:10.3399/bjgp10X482103. (2013) Persisting gender differences and attenuating age differences in cardiovascular drug use for prevention and treatment of coronary heart disease, 1998–2010. Eur Heart J 34(41):3198–3205. (2013) Statins and cardiovascular outcomes in elderly and younger patients with coronary artery disease: a post hoc analysis of the GREACE study. Arch Med Sci 9(3):418–426. (2012) Immediate and late benefits of treating very elderly people with hypertension: results from active treatment extension to Hypertension in the Very Elderly randomised controlled trial. BMJ 344:d7541. (2014) Effects of antihypertensive treatment in patients over 65 years of age: a meta-analysis of randomised controlled studies. Heart 100(4):317–323. (2009) Aspirin in the primary and secondary prevention of vascular disease: collaborative meta-analysis of individual participant data from randomised trials. Lancet 373(9678):1849–1860. (2000) C-reactive protein, cardiovascular risk factors, and mortality in a prospective study in the elderly. Arterioscler Thromb Vasc Biol 20(4):1057–1060. (2012) Disparities between prescribing of secondary prevention therapies for stroke and coronary artery disease in general practice. Int J Stroke 7(8):649–654. (2005) Knowledge and perception of guidelines and secondary prevention of coronary heart disease among general practitioners and internists. Results from a physician survey in Germany. Eur J Cardiovasc Prev Rehabil 12(6):521–529. (2003) A qualitative study of barriers to the use of statins and the implementation of coronary heart disease prevention in primary care. Br J Gen Pract 53(494):684–689. (2013) Incorporating lag time to benefit into prevention decisions for older adults. JAMA 310(24):2609–2610. (2002) Acceptance of guideline recommendations and perceived implementation of coronary heart disease prevention among primary care physicians in five European countries: the Reassessing European Attitudes about Cardiovascular Treatment (REACT) survey. Fam Pract 19(6):596–604. (1999) Why don’t physicians follow clinical practice guidelines? A framework for improvement. JAMA 282(15):1458–1465. (2009) ‘Aiming for the stars’–GPs’ dilemmas in the prevention of cardiovascular disease in type 2 diabetes patients: focus group interviews. Fam Pract 26(2):109–114. (2012) Financial reinforcers for improving medication adherence: findings from a meta-analysis. Am J Med 125(9):888–896. (2008) Perceptions of quality-of-life effects of treatments for diabetes mellitus in vulnerable and nonvulnerable older patients. J Am Geriatr Soc 56(7):1183–1190. (2013) Discontinuation of secondary prevention medication after myocardial infarction — the role of general practitioners and patients. Swiss Med Wkly 143:w13896. (2014) Medication adherence in a sample of elderly suffering from hypertension: evaluating the influence of illness perceptions, treatment beliefs, and illness burden. J Manag Care Pharm 20(1):58–65. (2014) Optimisation of secondary prevention of stroke: a qualitative study of stroke patients’ beliefs, concerns and difficulties with their medicines. Int J Pharm Pract 22(6):424–432. (2005) Making psychological theory useful for implementing evidence based practice: a consensus approach. Qual Saf Health Care 14(1):26–33. (2012) Validation of the theoretical domains framework for use in behaviour change and implementation research. Implement Sci 7:37. (2014) Role of fear in overdiagnosis and overtreatment — an essay by Iona Heath. BMJ 349:g6123. (2009) Is primary care a neglected piece of the jigsaw in ensuring optimal stroke care? Results of a national study. BMC Fam Pract 10:27. (2015) Perspectives of older people engaging in nurse-led cardiovascular prevention programmes: a qualitative study in primary care in the Netherlands. Br J Gen Pract doi:10.3399/bjgp15X683149. (2012) GPs’ perspectives on preventive care for older people: a focus group study. Br J Gen Pract doi:10.3399/bjgp12X658296. (2014) Deprescribing for older patients. CMAJ 186(18):1369–1376.